MOBILE, Ala. - The Navy's newest littoral combat ship, the future USS Coronado (LCS 4), departed from the Austal USA shipyard in Mobile, Ala., Jan. 27, en route to her commissioning site in Coronado, Calif.
Coronado is the fourth littoral combat ship delivered to the Navy, and the second LCS of the aluminum, trimaran Independence variant. It is scheduled to be commissioned April 5, and will be homeported in San Diego, Calif.
"It is exciting to see Coronado, operated by her Navy crew, exiting the new construction yard en route to her homeport," said Capt. Tom Anderson, LCS Program Manager. "There is a great sense of pride among the many who were involved in her construction in seeing her headed to sea to do what she was built to do." During her transit to the West Coast and prior to her commissioning, Coronado will conduct hull, mechanical, and electrical system shakedown events as well as navigation checks and combat systems test events. Additionally, the crew will participate in training events to continue honing their familiarity with the Independence variant. Prior to sail away, the Navy's Board of Inspection and Survey (INSURV) conducted acceptance trials aboard Coronado. INSURV found the ship's performance to be "strong" following what was hailed as "the most complete and rigorous trial on the Independence variant to date," and recommended the vessel be accepted. 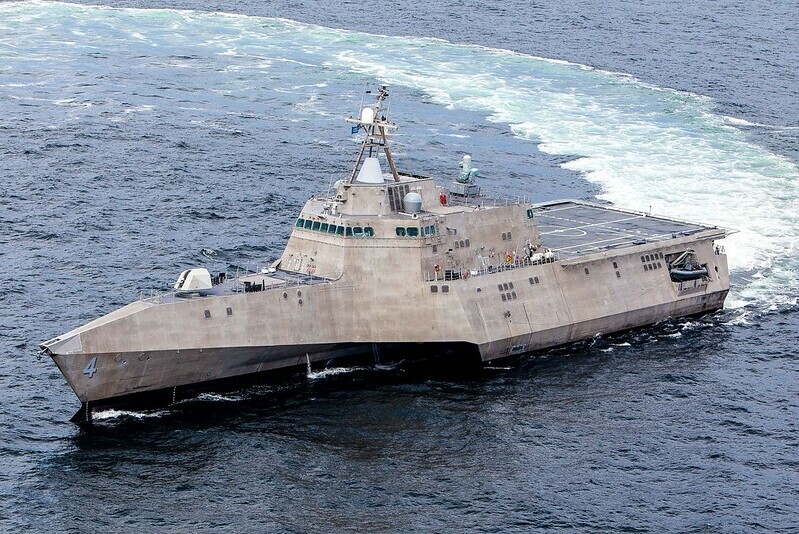 LCS 4 incorporated a number of design changes based on lessons learned from the first ship of class, USS Independence (LCS 2). These changes are now part of the baseline design and are being incorporated in the construction of follow-on ships of the Independence variant. The Austal USA team has Jackson (LCS 6), Montgomery (LCS 8), Gabrielle Giffords (LCS 10) and Omaha (LCS 12) under construction in Mobile, Ala. In March 2013, construction contracts were awarded for Manchester (LCS 14) and Tulsa (LCS 16). Program Executive Office Littoral Combat Ships is responsible for delivering and sustaining the fleet's littoral mission capabilities. Consistent delivery of high-quality warfighting assets, while balancing affordability and capability, is key to supporting the Navy's Maritime Strategy.